The Philippines Noel Celwyn Cartera raises the no. 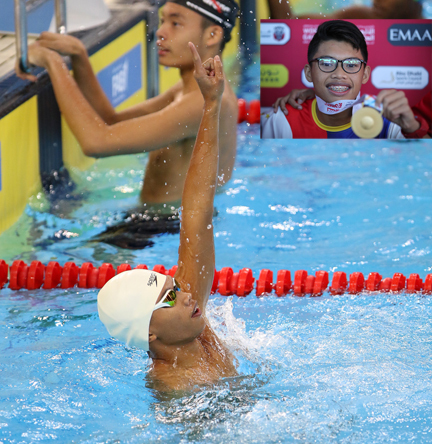 1 sign after winning the gold in the 50m backstroke of the Special Olympics World Games Abu Dhabi 2019 at the Hamdan Sports Complex in Dubai. Inset shows Cartera showing off his gold medal. Other gold medalists for the Philippines were Janice Trinidad in the 100 meters, Sheila Galvez in bocce and Alvie Dungca in gymnastics.